Recently we introduced an iCaching Facebook page. This is a nice way to interact with our users. So visit our page and like us! We had some trouble with the hosting of our website, so we had to re-setup the site. While doing this, we saw room for improvement, so the site has a new structure: the main features are listed on the homepage now and there is one support page for the faq and contact form. We hope this gives a better impression of iCaching. iCaching has a pretty powerfull filtering mechanism. You can do a single filter action by pressing the magnifier icon in the toolbar, but you can also save a filter as a so called ‘Smart Folder’. The filter dialog uses a standard Apple interface element to create the filters, but apparently not all users are familiair with this. One of the most frequent questions for support is how to create a ‘negative’ filter. E.g. 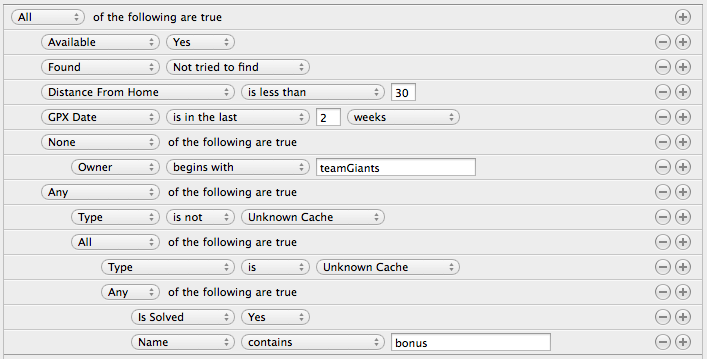 search for all caches not owned by me. Therefore this little post to give some insight. You can create a search based on one or multiple filters. 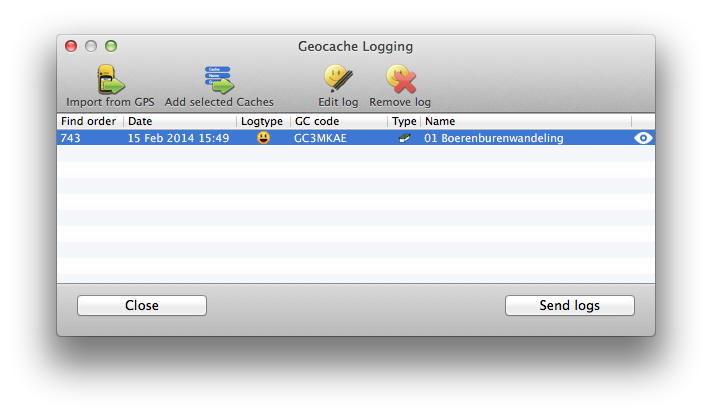 For most properties of the geocaches there is a filter. Clicking on a ‘+’-button adds a new filter. You can add a compound filter by clicking on a ‘+’-button while holding the alt (or option) key. You can drag filters around to organize the ordering of the filters. Start with the most discriminating filters, this way the filter function has less comparisons left for the second filter etc..
Also important for speed is the processing cost of a filter; a boolean comparision (eg. Available=Yes) is cheaper than a nummeric comparision, which is cheaper than a text-comparision. 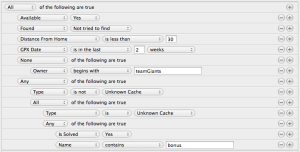 And last but not least: filtering on cacheproperties is (much) faster than filtering on it’s collections: additional waypoints, logs and attributes. After a three week struggle with a technical issue concerning App Store approval, I just resubmitted version 4.4 for review. So when the guys of the review team don’t have another surprise, this update can be available soon. This release is mainly a bugfix release. We managed to solve a bug in the importroutines for fetching pocketqueries through the API. As a little surprise, we added OpenStreetMap and OpenCycleMap support to the Map window. For this version there is no visible user interface yet to use these maptypes, but by pressing ‘o’ (for OSM) or ‘p’ (for SCM) you can use these. By the way, did you know that you can already use the keyboard shortcuts ‘r’ (roadmap), ‘s’ (satellite), ‘t’ (terrain), ‘u’ (satellite + roads) in the current version for switching maptypes? – You’ll get speed improvements during these background operations. – You can import bigger GPX-files without crashes. – All background operations are cancelable. And beside that, we added a new screen to the preferences panel. In this screen you can define the time-period for the following Library folders: New Caches, Recently Imported and Outdated Info. Together with Apple Developer support, we also solved a nasty bug that makes iCaching crash after import for some users. We want to send this version to Apple this week. The guys in Cupertino are on holiday next week, so I hope it can be released early next year. It’s about time for an update on our work on iCaching. We’re still busy with the big refactoring of the applicationcode. 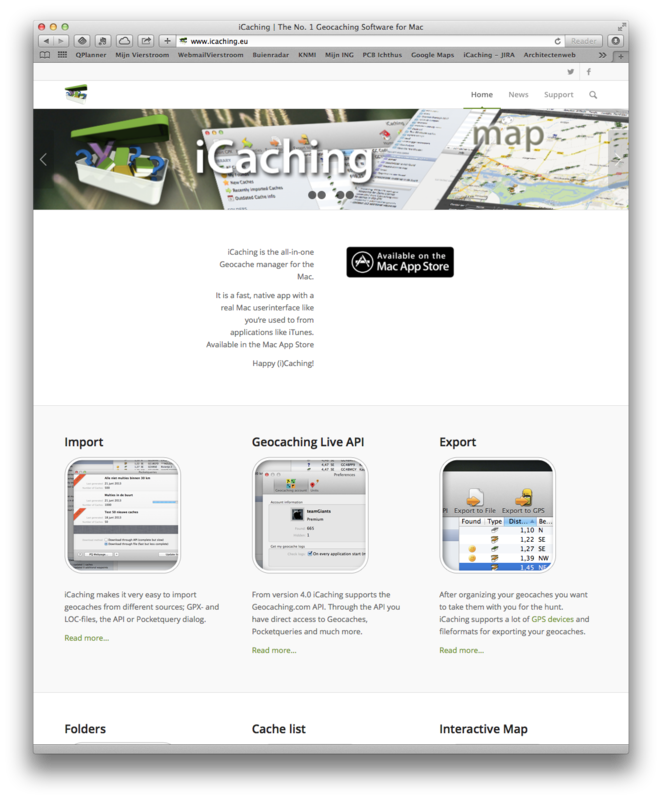 iCaching 4.25 is mostly a bug-solving-release. However, in version 4.25 we redesigned the usernote on the Info tab. Scrolling inside the note is improved and it is more easy on the eye. 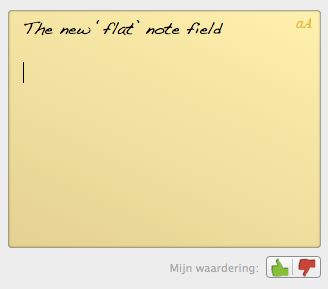 And besides: the old note wasn’t sharp in the upcoming OS X 10.9 Mavericks. So iCaching is fully prepared for 10.9 now. During the summer holidays we did a little programming on iCaching. Instead of adding new features, we focussed on cleaning up the codebase. Improve, cleanup and optimalization of the code. The result is a more stable and a little faster iCaching. And more room for adding new features in the future. Still wanting to add new features, we redesigned the Map window and added fullscreen mode to the Map window and the main window for users of Mac OSX Lion and higher. At the moment we are finishing the translations and hope to send version 4.2 to the App Store soon. 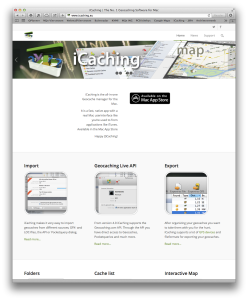 Alongside the new version of iCaching, we also release our new site. The new site contains information about all the new features of iCaching. The new site is fully responsive, so you can enjoy it on your desktop, but also on your iPad or smartphone. We have more screenshots than ever, so you get a good impression of iCaching.